On the banks of the river surrounded by leafy trees, an eclectic array of market stalls materialise each Saturday. Though the gypsy caravan hints at mystery, it’s the last place anyone would expect to find a Chai Wallah. Master of blends and years of dedication to spice, he blends a chai unrivalled by others. Once sipped there’s no returning. Eight organic spices harmoniously embrace organic assam tea. The delicate battle of milk and spice proportions ends here. 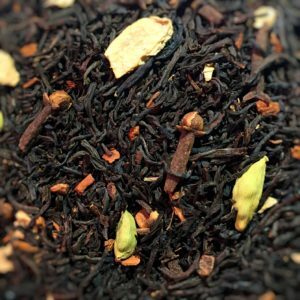 Ingredients: Organic Assam black tea, all organic spices: Cinnamon, liqourice root, ginger, cardamom, cloves, fennel, nutmeg, peppercorns.